This blog will be on vacation for a few peaceful summer weeks. 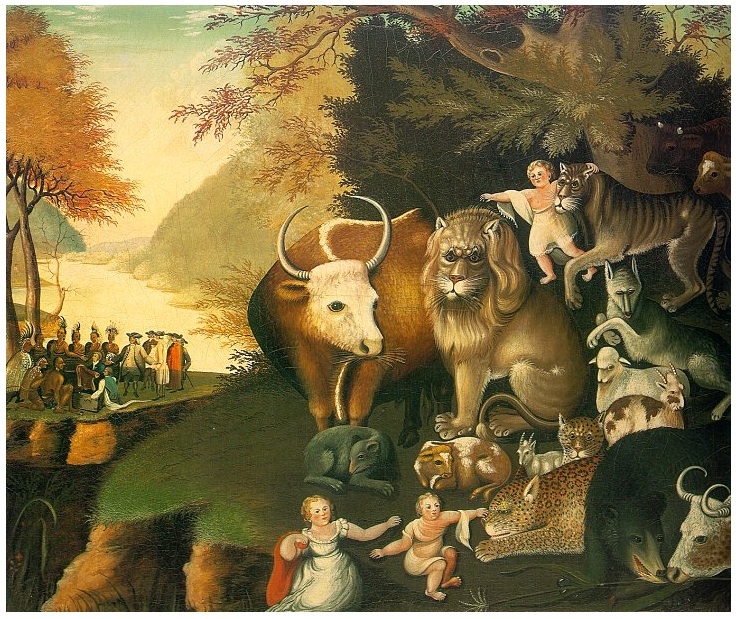 In the meantime, enjoy “The Peaceable Kingdom” by Edward Hicks (1780-1849). This is such a familiar piece that it’s hard to look at carefully, but it repays the effort. slavish adherence to the laws of, for example, gravity. But he cared about everything, which was his point. His landscape and critters, while certainly not naturalistic, are full of character and spirit, and the wandering eye is everywhere repaid with decorative delights. There is even a dry humor–the expressions of the animals, the pot-bellied citizens conferring in the distance. This is the art of painting in service to something beyond itself–not a concept that we emphasize these days, but by comparison with much of today’s fashion art, not to be despised.